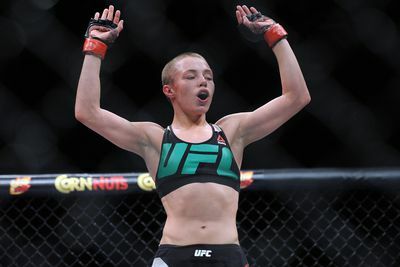 Let’s run down the list of “Who’s Hot” and “Who’s Not” from UFC Fight Night 80: “Namajunas vs VanZant,” which took place last night (Thurs., Dec. 10, 2015), nominating the biggest winners and losers from the UFC Fight Pass event inside “The Cosmopolitan” in Las Vegas, Nevada. Ultimate Fighting Championship (UFC) kicked off the highly anticipated three-event weekend last night (Thurs., Dec. 10, 2015) with a bang, as fight fans at “The Cosmopolitan” witnessed an epic UFC Fight Night 80: “Namajunas vs. VanZant” event, featuring a bevy of finishes and exciting fights. In the main event of the evening, Rose Namajunas completely outclassed Paige VanZant in her best performance to date, putting the entire Women’s Strawweight division on notice. The co-main event saw Michael Chiesa notch the biggest win of his career by submitting the very dangerous Jim Miller in the second round of their Lightweight clash. In a night full of outstanding performances, none were better than Rose Namajunas’ submission victory over Paige VanZant.